Given the size and tremendous heat capacity of the global oceans, it takes a massive amount of accumulated heat energy to raise Earth’s average yearly surface temperature even a small amount. Behind the seemingly small increase in global average surface temperature over the past century is a significant increase in accumulated heat. That extra heat is driving regional and seasonal temperature extremes, reducing snow cover and sea ice, intensifying heavy rainfall, and changing habitat ranges for plants and animals—expanding some and shrinking others. Explore this interactive graph: Click and drag to display different parts of the graph. To squeeze or stretch the graph in either direction, hold your Shift key down, then click and drag. The graph shows average annual global temperatures since 1880 (source data) compared to the long-term average (1901-2000). The zero line represents the long-term average temperature for the whole planet; blue and red bars show the difference above or below average for each year. According to the American Meteorological Society's State of the Climate in 2017, the year brought an end to the three-year streak of new record temperatures that were set each year from 2014­­­­­–2016. Depending on the data set used, 2017 came in second or third warmest, after 2016 (warmest) and 2015 (second or third warmest). The near-record temperatures occurred in the absence of El Niño, which is usually a factor in extreme global warmth. For much of 2017, El Niño-Southern Oscillation (ENSO) conditions were neutral, and October 2017 brought the start of La Niña, which typically drops global temperatures. Despite this, 2017 readings were 0.38­–0.48° Celsius (0.68–0.86° Fahrenheit) above the 1981–2010 average, depending on the dataset. It was the warmest non-El Niño year in the instrumental record. Global surface temperature in 2017 compared to the 1981-2010 average. High latitudes of the Northern Hemisphere were especially warm, though temperatures across most of the planet were warmer than average (red colors). NOAA Climate.gov map, based on data from NOAA NCEI. Though warming has not been uniform across the planet, the upward trend in the globally averaged temperature shows that more areas are warming than cooling. Since 1901, the planet’s surface has warmed by 0.7–0.9° Celsius (1.3–1.6° Fahrenheit) per century, but the rate of warming has nearly doubled since 1975 to 1.5–1.8° Celsius (2.7–3.2° Fahrenheit) per century, according to the international State of the Climate in 2017 report. The 10 warmest years on record have all occurred since 1998, and the four warmest years on record have all occurred since 2014. Looking back to 1988, a pattern emerges: except for 2011, as each new year is added to the history, it becomes one of the top 10 warmest on record at that time, but it is ultimately replaced as the “top ten” window shifts forward in time. By 2020, models project that global surface temperature will be more than 0.5°C (0.9°F) warmer than the 1986-2005 average, regardless of which carbon dioxide emissions pathway the world follows. This similarity in temperatures regardless of total emissions is a short-term phenomenon: it reflects the tremendous inertia of Earth's vast oceans. The high heat capacity of water means that ocean temperature doesn't react instantly to the increased heat being trapped by greenhouse gases. By 2030, however, the heating imbalance caused by greenhouse gases begins to overcome the oceans' thermal inertia, and projected temperature pathways begin to diverge, with unchecked carbon dioxide emissions likely leading to several additional degrees of warming by the end of the century. The concept of an average temperature for the entire globe may seem odd. After all, at this very moment, the highest and lowest temperatures on Earth are likely more than 100°F (55°C) apart. Temperatures vary from night to day and between seasonal extremes in the Northern and Southern Hemispheres. This means that some parts of Earth are quite cold while other parts are downright hot. To speak of the "average" temperature, then, may seem like nonsense. However, the concept of a global average temperature is convenient for detecting and tracking changes in Earth's energy budget—how much sunlight Earth absorbs minus how much it radiates to space as heat—over time. To calculate a global average temperature, scientists begin with temperature measurements taken at locations around the globe. Because their goal is to track changes in temperature, measurements are converted from absolute temperature readings to temperature anomalies—the difference between the observed temperature and the long-term average temperature for each location and date. Multiple independent research groups across the world perform their own analysis of the surface temperature data, and they all show a similar upward trend. Yearly global surface temperature from 1900–2017 compared to the 1981-2010 average (dashed line). The different colors represent different research groups' analysis of the historical temperature record. NOAA Climate.gov graph adapted from State of the Climate in 2017. Details on the datasets can be found in Table 2.1 and Figure 2.1 in the report. Across inaccessible areas that have few measurements, scientists use surrounding temperatures and other information to estimate the missing values. Each value is then used to calculate a global temperature average. This process provides a consistent, reliable method for monitoring changes in Earth's surface temperature over time. 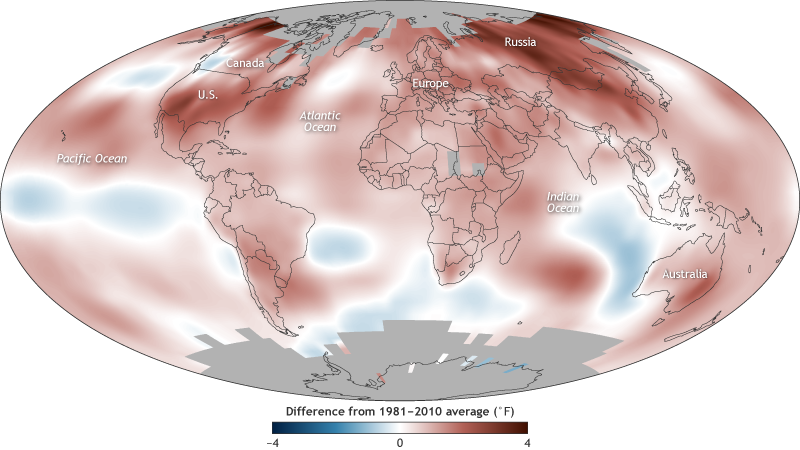 Read more about how the global surface temperature record is built in our Climate Data Primer. Sánchez-Lugo, A., Morice, C., Berrisford, P., Argüez, A. (2018). Temperature [in State of the Climate in 2017]. Bulletin of the American Meteorological Society, 99(8), S11–S13. NOAA National Centers for Environmental Information, State of the Climate: Global Climate Report for Annual 2017, published online January 2018, retrieved on August 2, 2018 from https://www.ncdc.noaa.gov/sotc/global/201713. Annual global temperature anomalies for land and ocean combined, expressed as departures from the 1901-2000 average. National Climatic Data Center. Do you have feedback to offer on this or another article? Based on NOAA data, the 2017 average global temperature across land and ocean surface areas was 0.84°C (1.51°F) above the twentieth-century average of 13.9°C (57.0°F), making it the third-warmest year on record behind 2016 (warmest) and 2015 (second warmest). It was the warmest non-El-Niño year in the record. 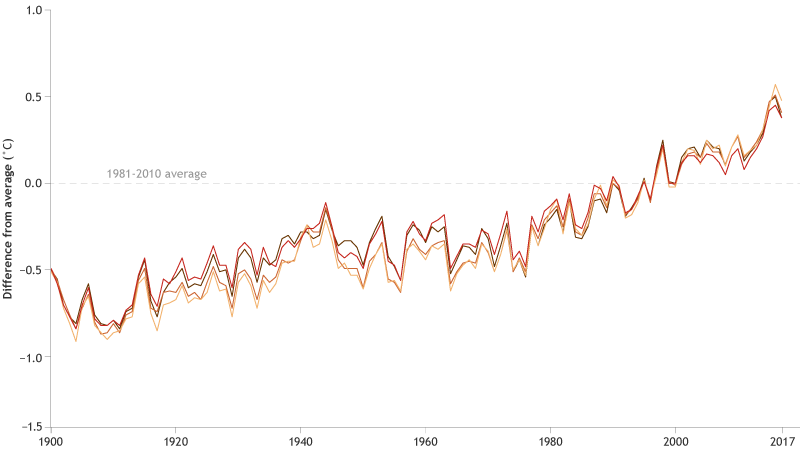 Global temperature hasn't been cooler than the twentieth-century average since 1976. Since the start of the twenty-first century, the annual global temperature record has been broken five times. From 1900 to 1980 a new temperature record was set on average every 13.5 years; however, since 1981 it has increased to every 3 years.